I have a love/hate relationship with Kansas City, my home since winter of 2008. The weather is insane, hate. The crime rate is really high, hate. The sports teams are ALLCAPSAWFUL, hate. But the BBQ is heavenly, love. The highways make it a dream to get around, love. And there is so much to do here. This morning we woke up with no direction. We ate breakfast, sat around in our pajamas with SportsCenter on (I’ve been brainwashed) and watched the late morning sun shake off the chill of last night. So after a quick Google search of events in our area, we headed out to the 2012 Flights of Fancy Kite Festival. I wasn’t sure what to expect since I’d never even heard of this thing before, but that’s kind of the beauty of living in a “newish” place – there’s always something new to discover. When we pulled up next to MCC-Longview, the sky was a sharp blue and the breeze barely tickled the tops of the trees. Parking was easy enough to find with only a short walk to the festival field. Monkey had fallen asleep during the drive so when we got him out of the truck he put on his best grump face, crossed his arms and slumped in the stroller. But as soon as we made it around the bend, he saw this and perked right up. There are certain days in spring where living feels like Heaven on Earth, and this was one of them. The breeze picked up. The savory smells from the food trucks intermingled with the sweet scent of the freshly-mown grass. Strains of rock music provided a beat for the announcer as she told us all about the different kites in the sky. People are serious about kites, it seems. They have a club, y’all. One guy had several kites that he would rotate through. Some of them were fast and capable of quick, twisting maneuvers, like this one. Others were large and capable of pulling some weight and he would have to throw himself backward onto the ground to keep from being pulled aloft. While many, many people brought their own kites, we were just happy to stand and observe, to be a part of the landscape and to witness such a perfect day as this. I think we definitely need a kite now. Kites are also what they call notes prisoners pass in jail. Don't ask me how I know that. It was a really pretty event. 🙂 I had no idea you had ties to KC! Definitely next time you head this way, let me know. We will grab GFunk as well and make a party out of it! My goodness, I can’t believe it took me so long to absorb the fact that you are in KC. I’m in Olathe and was raised in Prairie Village. I’ve spent my whole life wishing I lived near some mountains, but it’s not too bad here, especially for cultural events. Mostly I hang out at the Nelson…. Heh, I don’t blog much about the town, I guess! I’ve never been to the Nelson. Hubs always said we’d go, then we had a baby, and then…yeah. So maybe one of these days! I would love to go. It was surprisingly relaxing, watching all the kites. Austin has pretty fun festivals, I don’t doubt it! I kind of hate kite flying… feel free to crown me worst mother ever. I hate bubbles too. Your men have the same cheeks!! So sweet! Jamie, do you hate puppies and kittens too? Gah. 😉 My boys are just about carbon copies of each other! Looks like y’all had fun. I love that Monkey is a “Go Bug” like his Mama. We did! I think it’s cute that he loves to “go” as well. All that traveling we did early got him used to the carseat, I guess! I love watching kites. So fun and pretty. I had never really thought about it until yesterday! It’s a neat hobby to have. Now that sounds like a perfect moment. 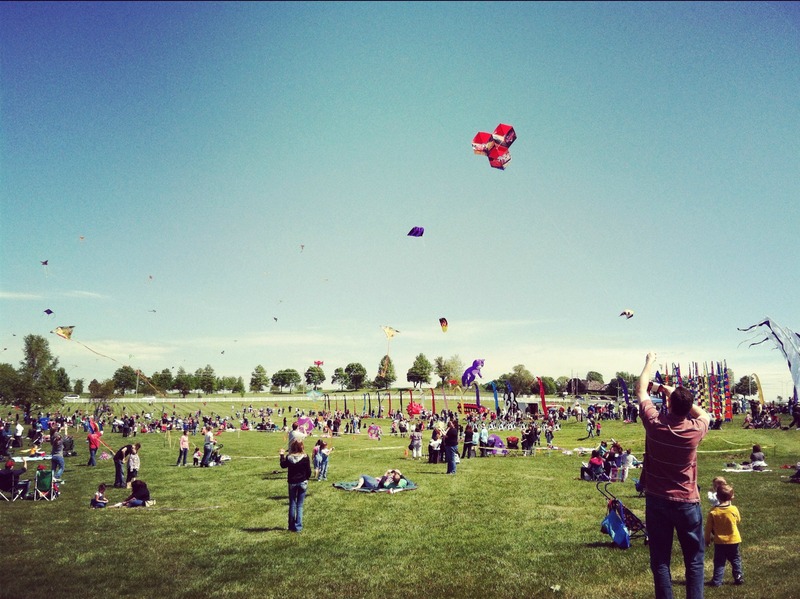 We have a kite festival in Reno every year and the kids love it. Can I visit you for some BBQ? All these kite festivals, and I had no idea! Jessica, if you’re ever in KC, I will totally take you out for BBQ. That looks like SO much fun! I need to see if we have something like that for us to go to as well. I bet Donut would LOVE it. Tell the mister there is no wood, sorry. Today was love, indeed. Looks like the perfect afternoon. Yes, I am lazy. But in a “I’m setting a good example of how to relax in your future” kind of way. Please tell me that exists. Oh I love this. Brian has a huge love for kites and collects them. He has them hung in the garage and brings them out on windy days. The massive fabric takes practice to control!! We don’t have anything like what you went to around here. I wish we did, it would have been wonderful. That’s so cool! I had no idea. I need to see pics!